By now, you’ve probably heard about the Vampire Facial®, which quickly grew in popularity after a picture of Kim Kardashian post-treatment made the rounds on social media a few years ago. Despite the revolutionary nature of this non-invasive cosmetic treatment, misinformation has been spread across the internet, leaving patients very confused and physicians and practitioners frustrated. I am not only a certified provider of the Vampire® procedures, but also one of the few expert trainers in the world who teach other physicians and practitioners how to perform these treatments on behalf of their inventor, Dr. Charles Runels. I know first-hand how powerful, safe and effective the Vampire Facial® can be for people of all skin types, and feel it is my duty to help put an end to some of these myths about which my patients regularly inquire and are concerned with to the point of irrational fear. The good news is, once I am able to share with my patients the facts and truth about this procedure, the fear quickly subsides and turns into excitement about the amazing results it can deliver. Kim Kardashian perpetuated this unfortunate myth via an episode of Keeping Up with the Kardashians, where she received a Vampire Facial® and screamed (dramatically) because of the pain. What viewers did not know was that Kim did not receive the standard numbing cream used by all reputable providers. In reality – not “reality show” – a certified provider will use a medical-grade numbing cream to ensure the procedure is completely painless. Our patients report no discomfort during or after the procedure, and typically only experience mild redness for the following 12-24 hours. All of our patients say it is one of the most enjoyable procedures that have undergone! Let’s be clear—the Vampire Facial® is NOT a facelift or invasive procedure. This myth likely stems from people looking up images or videos of celebrities with blood on their faces after receiving the procedure. The good news is, like most everything attached to the celebrity world, it’s just a silly rumor and actually a result of the provider not using the right lab equipment. If PRP is properly obtained and processed through an FDA-approved method and sterile centrifuge, there will not be any red blood cells (red color) at all – pure PRP is completely yellow. Also, you are not going under the knife or anesthesia, but rather under a very tiny microneedle. The treatment is completely non-surgical and non-invasive, and is a great alternative—both in cost and pain level—to other aesthetic facial procedures. This myth is patently false. 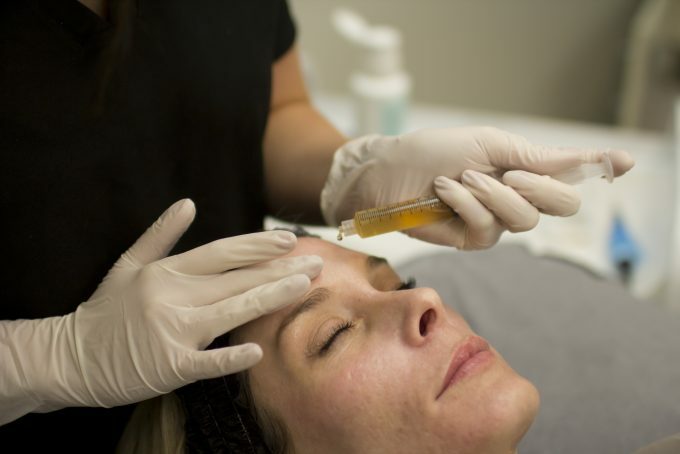 In fact, there has never been a single reported complication from injecting growth factors, found in platelet rich plasma (PRP), into your skin, tissue or body. Why? PRP is a concentrated source of platelets, growth factors and cytokines found naturally in your own body that stimulates and controls healthy regenerative processes, including collagen and soft tissue remodeling, and improves overall health and rejuvenation. During the Vampire Facial, the PRP (painlessly obtained through a small, standard blood draw like you would receive at any doctor’s office) is topically applied and drives the amazing results of this procedure. It’s important to consult with a certified provider of the Vampire Facial®, who is supervised by a trained physician, regarding the efficacy of this procedure and whether it’s right for you – not armchair physicians on the internet. The facts are as follows: First, PRP has been used for decades in different medical and surgical fields, and there are tens of thousands of published medical studies supporting both its uses and successes. Second, the Vampire Facial® can vastly improve the overall look, health and quality of your skin. It can help even out skin tones, color and complexion. The procedure can also improve the texture, volume and smoothness of your skin, giving you a glow and youthful look without undergoing expensive and invasive plastic surgery. Best of all? You should see results within a few days, and the results will continue to improve over the coming weeks and months. It is, hand-down, the best procedure we offer in terms of affordability, lack of downtime and safety for all skin types, ages and conditions. It’s a patient favorite for good reason! Wrong! Immediately following the treatment, patients will experience an incredible glow and improved texture of their skin. At most, you will have 12-24 hours of mild redness with minimal-to-no swelling. This can easily and safely be covered with makeup. Generally, you can go to work the next day and no one will know you had an aesthetic treatment performed. Results will continue to improve over the next several weeks, with reduction of pore size, decrease in acne, smoothening of skin and the beginnings of collagen stimulation. Keep in mind these are just a few of the myths about the Vampire Facial® that we know are circulating out there. If you are interested in learning more about this incredible procedure or have additional questions you’d like answered, give us a call today and schedule a consultation!